Nicolas Lapointe, CWF conservation officer, and Kirby Punt of Ontario Ministry of Natural Resources and Forestry doing surgery on a young American eel to implant a tag for monitoring its migration in the Ottawa River. A little backstory: The American Eel used to be the most common fish in the Ottawa River, making up half of the fish biomass there. They were an important and sacred species for the Algonquin people, who travelled to fish for them during their seasonal migration. Now less than one per cent of the population of American Eel remains in the Ottawa River. The main culprits are dams, especially hydro dams, which block eels from migrating. American Eels spawn in the Sargasso Sea near the Bahamas, and tiny juvenile eels drift across the Ocean then swim back up the St. Lawrence and Ottawa River, historically as far as Algonquin Park. They would feed and grow there for 20 to 40 years before making one final trip back to the sea to spawn. The problem they’re running into is finding a way through the turbines at each dam they pass. Our efforts are an early step to help eels get around the first major barrier on the Ottawa River – Carillion Dam. Although the American Eel is endangered in Ontario, restoration efforts remain in their infancy. This is due in part to major delays by the government of Ontario in publishing a recovery strategy and issuing a response statement. The Endangered Species Act was passed in June 2008, and these steps should have been completed by March, 2013. Despite these delays, our partners are finding ways to work together to help eels in the Ottawa River, and last week’s transport and release event was pretty astounding. Everyone wanted to help out, and there were at least 40 people there representing non-governmental organizations, provinces, hydropower companies, First Nations, and research institutes. Our task was to take the 400 eels that had been brought from the eel ladder at the Beauharnois Dam, measure and weigh them, and implant an identifying tag in each one before releasing them in the river. With so many people and so many eels, the day was a flurry of activity. Many there had never seen an eel, and it was great to see their reactions as they watched the curious eels stick their heads out of the water, trying to find a way out and back into the river. 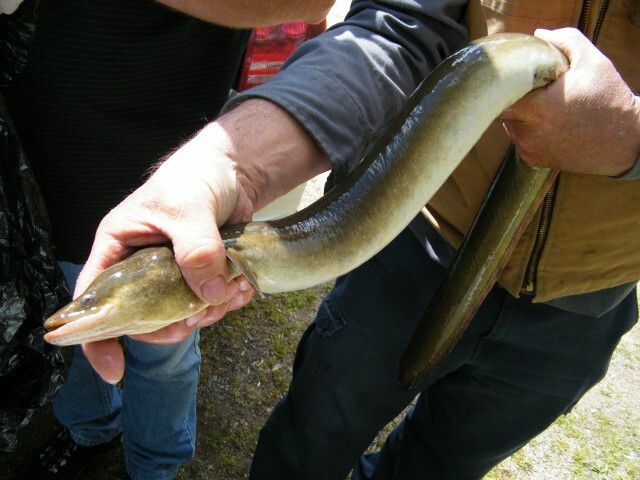 Five of the larger eels received an additional transmitter as a part of a joint study between CWF and the Ottawa Riverkeeper. They were released in Brewery Creek in Gatineau, to find out whether eels can use this creek to get around the second major dam on the Ottawa River at Chaudière Falls. We’ll track their movements over the summer, and find out where they went this fall. 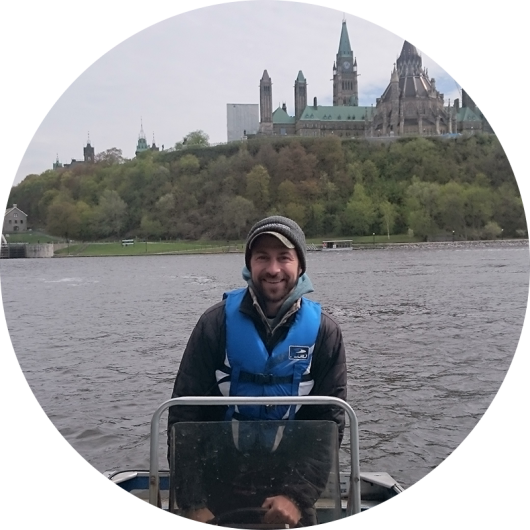 In the meantime, I am very encouraged by how many people and organizations are eager to contribute their time and resources to help recover American Eels in the Ottawa River. Four hundred eels is only a fraction of what used to move upstream each year, but it is definitely a great start! 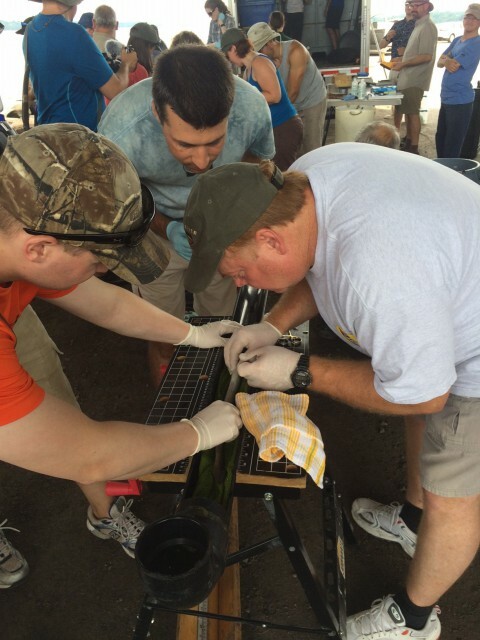 Thank you to all the volunteers and the CWF for your efforts to restore eels to our rivers. Many would not care because of the supposed insignificance of this creature. I think it is wonderful work that you have done.